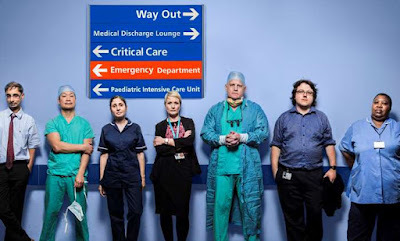 There's a documentary series - Hospital - on at the moment that was filmed at the beginning of this year at the Queens Medical Centre in Nottingham. It follows the staff and patients of my local hospital as they struggle to cope with the demand of a particularly brutal winter. Watching it is an emotional experience: I get a surge of pride when I see what a wonderful institution the NHS is and how these dedicated staff are able to give the best possible care they can to every patient, but I also get very angry when I see the impact that decades of cuts are having on this service and how they compromise that care at every turn. They say that the more direct experience you have with the NHS, the more you appreciate it.... but it's heart-breaking to see the impossible decisions that doctors are forced to make when we simply don't have the resources to provide the right level of care. This week followed a surgeon who specialised in head and neck cancers. He loves his job and had extended a six month posting to cover eighteen months, but he was working in a ridiculous short-staffed department of two surgeons (when there should have been four). With his wife already working as a plastic surgeon in the USA, he took the decision to give the department five months' notice that he was going to leave the UK and follow her. Although the NHS is a wonderful and precious thing, he said, in the USA he would have the time and resources to provide a better quality of care to a smaller number of patients. What he didn't say was that this care would only be provided to those with the insurance to be able to pay for that care... which, for all of its failings, is not true of the NHS, even if it's what some of our politicians seem hell-bent on delivering for us. During the course of this week's programme, we watched this same consultant being asked by the camera team if a delay to surgery to one lady had played a role in her cancer becoming inoperable. Conscious that he was being filmed, he picked his words carefully: well, it's difficult to say for sure and absolutely impossible to prove... but if someone had told me that this is how my mother had been treated, I would be very angry. Enough said, I think. The lady herself was heartbreakingly phlegmatic: "I'm old, I've had a good life, done everything I wanted to do and been to every part of the world I've ever wanted to visit...". I was in pieces watching this on my sofa. As we left, C. asked me how I felt. I've got a few decisions to make about whether I want to resume my injections, or if I want to continue taking nothing and six monthly MRI scans to check that my disease is continuing to progress as slowly as it has seemed to for the last ten years. Do I want to go back onto the treatment I've been using for the last ten years, or do I want to roll the dice? It's a tough one. But how do I feel? Honestly? Well I don't know if I know the answer, or if there are any right answers here, but how do I feel? Lucky. I'm running the London marathon in a couple of weeks; I'll also be running the Liverpool marathon in May too. We're raising money for the MS Trust. At my appointment today, the nurse who saw me was trained and partially funded by the MS Trust; the leaflets that we were given to take away to help with our decisions are written and produced by the MS Trust. This small charity provides a crucial support to the medical teams that support patients with MS, and they provide support and information to the families of people affected by the disease. I'm so proud that I'm able to do something to help them continue their work and to continue to support the NHS and people with MS.
You can sponsor us here! The money that you good people have donated so far will make a massive difference to the lives of people with MS and their families. No one should have to go through this alone.